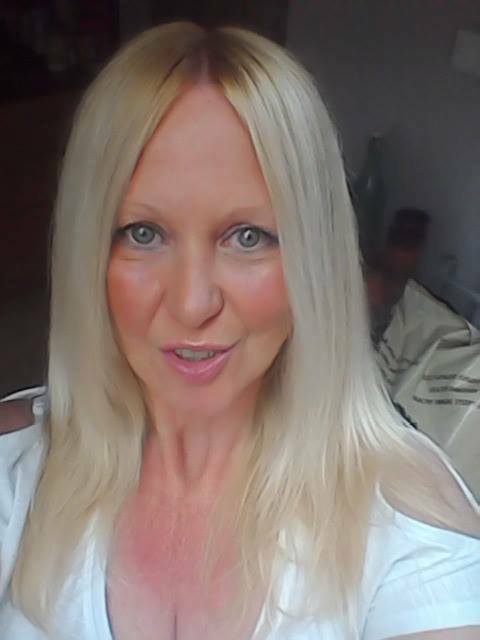 THE BEAUTEOUS TWINKLBEAR: Was she my “Podmate” in a Soul Pod? We think she was. THE BEAR POD: Were Twinklebear and I originally Soulmates in this Soul Pod? With this type of subject, I feel like I always have to preface it, as if addressing extremely large men in white coats with pitiless eyes, toting man-sized butterfly nets. It is that kind of unconventional subject, that chronically makes me cringe. My brow starts to sweat. I get a bit dizzy. My stomach clenches up. I feel like I used to in school, facing a crucial test, after neglecting to study for it. I feel as if I might as well be saying, with a slightly crazed, but mock-deadly serious tone of voice…. Can you say, vasovagal reaction? Hey man, catch me when I fall, okay? But, this is a deadly serious subject. Very few of us, are supremely privileged enough, to know for sure what will happen in the “afterlife,” or any other area of the so-called “spiritual realm.” Religion flourishes, for just this reason…. Because it is the unknown. The spiritual realm also includes reincarnation, the role of “past lives” in our current existences, and indeed, if past lives even exist. I’ll tell ya what. If any of you mutts definitively know the answer to these clearly unanswerable questions—and that includes you extremely large men with protruding brows, toting man-sized butterfly nets—speak up now and be heard. Ah ha! I thought not! So, before anyone here is ready to commit me to a mental institution, try to keep an open mind and listen up! You know from previous installments of my Sookybear Memoir series, Twinklebear and I have always believed that we were true Soulmates, from practically, the first day on, when we first met. There was a “knowing” of each other, that could only have been explained by us, having been intimate in past lives. Hence, we believe that we are reincarnated lovers and spouses. We also check off the boxes that would indicate that we are Soulmates. We know what the other is thinking, we say the same things at the same times, we know when the other is troubled or worried by instinct. We stare into each other eyes, for hours on end, being totally absorbed. There is the mutual interminable feeling, of being crazy in love with each other, a feeling far exceeding any that we have felt with anyone else. This latter is an infatuation that does not end. We talk for hours on end, and the hours feel like mere minutes. We feel incomplete, when apart. We have an insatiable need to be with each other. In other words, we are the Stereotypical Soulmates that are spoken about, in hushed, dulcet tones, by spiritual people. We check off every box, and meet every single True Soulmate criteria. Given all that, why wouldn’t we believe that our Souls were together, in a Soul Pod, in a Galaxy, far, far away, somewhere early in the time-space continuum? Logic would dictate, that we’d have to believe it, considering how Twinklebear and I, are with each other. If you need clarification, see previous Sookybear Memoir installments. 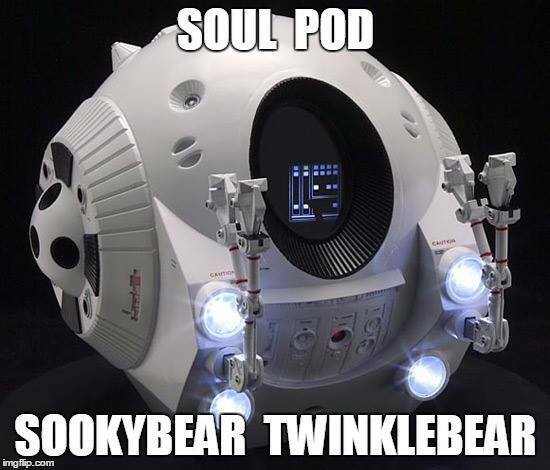 I would like to point out, that when Twinklebear stated that we were Soulmates in a “pod,” that she had never heard of the term of “soul pod,” and had not read any literature citing “soul pods.” That is what I find significant about this Soul Pod business. Read into that what you will. She does have some psychic ability, particularly the foreknowledge of events to happen, that she sees in dreams. I myself, have seen this to be true. Perhaps she even has profound hindsight, that would allow her to cull memories of “pods” in the very distant past, from her subconscious. What should we expect beyond life? Do I believe in God, is there an afterlife? Thank you so much my sookybear soul mate pod mate, for putting our journey so far into words. It really has been a pleasure, and a unique experience, to know we are from the same pod. Btw ” don’t put the cat or so early next time round ” !! You !! 🙂 love you always and a day! .121212 soul mate, pod mated , for eternity !, i love your articles. Always as they are so true ..
Tell me about it for the next 100 years ,I had to put the rubbish, out myself ! Ha! Then I woke up in ” Hastings !!! ” ha!! ” England !!! ” you see you took all the clocks, in the rubb ish, as I’d thrown them all out .! As you were getting a little” OCD” about this time concept of yours… he!! ” time ! What’s that? ” for Lord’s sale !! 🙂 12 always and a day my pod pal soul mate. Love always and forever. ..